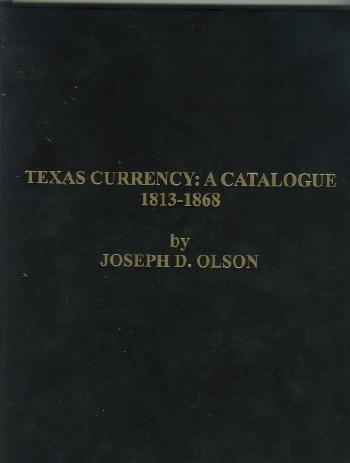 Not since the publication of Texas Obsolete Notes and Scrip by Bob Medlar in 1968 has a single work been released dealing strictly with the collection of Texas paper money. This new book, though not including local scrip issues, is significantly more detailed than the Medlar work in the areas that it does address. The notes are listed in chronological order beginning with the earliest Spanish and Mexican issues, and concluding with the various notes issued by the state during the turbulent years of the Civil War. Each type note is attractively illustrated, with the rarity, value and short description appearing in a box below. Also in this box is an identification number assigned by Mr. Olson, as well as the corresponding Criswell number (taken from Grover C. Criswell's Confederate and Southern States Currency) and the number of notes issued (where known). Selectively placed among the notes are short biographical sketches of the many important Texas individuals who signed or were associated with the issuance of these pieces. Several pages are devoted to city and county issues, as well as a few private issues from Galveston, Harrisburg and Nacogdoches. A "Document Identification Table" at the conclusion compares the Criswell, Medlar and Olson numbers in an easy to understand format, a great asset to those collecting these fascinating notes. A volume worthy of inclusion in any currency collector's library. Olson, Joseph D. Texas Currency: A Catalogue 1813-1868. Waco: Corporate Image, 2006.